Analysis and interpretation of single ion channel records and macroscopic currents using matrix methods. A summer workshop: 25 -29 July 2011, Now open for registration. A workshop on analysis and interpretation of single ion channel records and macroscopic currents using matrix methods. The aim of this workshop is to explain the theoretical background that is needed to interpret ion channel experiments in terms of physical receptor mechanisms. In order to do this, in any case apart from the very simplest, it is essential to know some basic ideas about matrices, and the workshop explains how to do it. We also demonstrate the set of computer programs that we have developed for the analysis and interpretation of single channel recordings. Apply as below. No particular qualification is needed other than enthusiasm, and the most elementary calculus. In particular no knowledge of matrices will be assumed. People of any age or rank are welcome, as are applicants from industry as well as from Universities. Please apply by email (see below). We will only be able to take 12 - 16 people because of the need for individual attention in tutorials. Last year we were heavily oversubscribed. Applicants will be contacted directly by the organisers for more details about their background and reasons for interest in the workshop. Because people from outside UCL may be interested, the workshop will be run full time for one week, immediately after the end of term. Each day will be divided into lectures (with some computer demonstrations as part of the lectures) and tutorials. Each set of lectures will be followed by a tutorial session (up to four students per tutor) in which the material in the lectures will be explained and exemplified using programs such as Mathcad (to a lesser extent we can also cope with Maple and Matlab), as well as our own programs. The use of our own programs for calculations and fitting will also be shown in the tutorials. In last year’s workshop, even those with no previous experience of matrices were able to compute (in Mathcad) things like a burst length distribution for some specified mechanism by the end of the workshop. It would be useful to have in advance a description of each student's experience with (a) ion channels and (b) mathematics. It is also important that if students bring a laptop computer with them (if you can bring Mathcad too, so much the better). The laptop should have enough disk space to allow us to install the programs and other material that you’ll need. Matrices as a convenient notation for simultaneous equations and as a convenient way of multiplying and adding probabilities, illustrated by a simple Markov chain. Inversion of matrices, and definition of determinant. Differentiation of a matrix and exponential of a matrix. Convolution: meaning, done explicitly, and by Laplace transform method. Description of macroscopic (‘whole-cell) currents in matrix notation: a single equation for any sort of experiment. A simple ion channel mechanism analysed without matrices. Distributions of open and shut times using matrices -comparison with the same simple case as done above without matrices. Division of single channel records into bursts and clusters of channel openings. Number of openings per burst: simple case, geometric distribution. Generalisation: sets of states and why matrices are useful; definition of Q matrix, and its partitioned forms. Generalisation of analysis of bursts of openings. What are the ubiquitous GAB and GAB(t) matrices? The distribution of the number of openings per burst: general form. The distribution of the open time, burst length and open time per burst; general forms. Equilibrium occupancies and macroscopic currents. The crucial role of entry probabilities: how to define the initial vectors for openings, fo, and for bursts, fb. How to calculate things like exp(QAAt): eigenvalues, eigenvectors and the beautiful spectral expansion theorem. Correlations between open times and shut times (and the rank of a matrix). Bivariate and conditional distributions. Implications for connectivity of reaction schemes. Single channels after a jump. Non-stationary single channel behaviour. The relationship between single channel behaviour and macroscopic currents. Use of programs for analysis of experimental data, particularly direct fitting of a mechanism with HJCFIT. 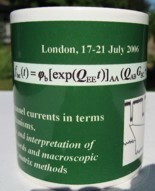 By the end of the workshop you should be able to understand the formula for the burst length distribution that appears on the workshop mug, at least well enough to evaluate it, and at best to be able to derive it. To see some pictures taken on previous workshops, click here. This workshop is offered free of charge to UCL research students and postdoctoral staff (Roberts agenda funds will be used). For all other people, there is a charge of £150 (but if you can't find this amount please email and we'll try to help). To apply for a place please send your CV and state your interest in the workshop, by email to David Colquhoun or Lucia Sivilotti. Tutors: Remigijus Lape and Andrew Plested. Page last updated: 22 August 2010.